An international coalition of pro-Palestinian agitators launched the Gaza’s Ark project to breach what they claim is Israel’s "illegal and inhumane Israeli blockade of Gaza." The group, which has ties to Hamas, intends to stock a ship full of Palestinian products and sail out of the Gaza Strip to "export" the goods. Activists intend to purchase "a run-down boat from a local [Palestinian] fishing family," according to Michael Coleman, a member of Free Gaza Australia who spoke to the Commentator about the new revamped flotilla initiative. "The refurbishing will be done by Palestinians in the port of Gaza, and the sailing will be with a mixed crew of Palestinians and internationals," David Heap, another Gaza’s Ark spokesman, told the Commentator. Middle East experts criticized the Gaza’s Ark campaign as an intentionally provocative stunt aimed at sparking yet another confrontation with Israeli authorities. Many of the same organizations that sponsored the 2010 flotilla effort are also backing Gaza’s Ark. "It’s about publicity," said Jonathan Schanzer, a Middle East expert and vice president for research at the Foundation for Defense of Democracies. "The first [flotilla] ended in violence and the other ended in legal entanglements. The common theme in each failed attempt was the attempt to generate global awareness"
Israel maintains a blockade of Gaza to prevent Hamas terrorists from importing rockets, bombs, and other weapons that could be used to kill Israeli civilians. Palestinian activists attempted to breach Israel’s blockade of Gaza in May 2010, when six ships dubbed the "Gaza Freedom Flotilla" sparked a deadly international incident. Israeli authorities had ordered the fleet to halt its approach of Gaza multiple times. However, the activists ignored the warning, leading Israeli soldiers to board the vessels, where an armed riot eventually broke out. 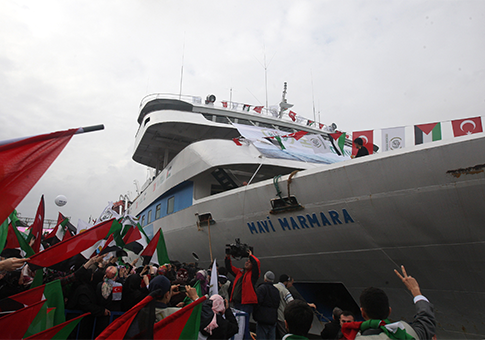 Armed activists on the Turkish ship Mavi Marmara attacked Israeli soldiers as they boarded the vessel. Ten Israelis were wounded during the attack, as well as eight Turkish citizens. The incident led Turkish Prime Minister Recep Tayyip Erdogan to demand an official apology from Israel. Relations between the two countries disintegrated in the ensuing years. Tensions between the two countries have eased in recent days after Israeli Prime Minister Benjamin Netanyahu apologized to Erdogan following President Barack Obama’s trip to the region. Erdogan accepted Netanyahu’s apology and demanded, among other things, that Israel ease its blockade of Gaza. Israel has proposed to pay $100,000 in compensation for each Turkish victim who died on the flotilla, though Erdogan has reportedly demanded $1 million for each family. The upcoming Gaza flotilla brigade will aim to deliver "Palestinian products to fulfill trade deals with international buyers," according to Gaza Ark’s mission statement. "Gaza’s Ark is providing training to Gaza’s sailors in the use of up-to-date electronic sailing equipment and techniques, which they have been denied for years as a result of the blockade," the group states on its website. Israel is the Palestinian territories’ largest importer, purchasing 86 percent of their goods in 2011, according to the Jerusalem Post. Exports from the Gaza Strip and average salaries for workers grew in 2012, according to the Israeli Defense Forces. Unemployment rates decreased. Schanzer said the Gaza’s Ark effort is more about delegitimizing Israel than anything else. "The ultimate goal here is to draw attention to the blockade while drawing international condemnation of the Israelis," he said. "If the organizers wanted to help end the Hamas government's isolation, they would need to turn to Egypt. Cairo holds the key to Gaza's economy"
The organization is comprised of anti-Israel activists from across the globe, including the U.S., Canada, and Europe. They include aging radical Noam Chomsky, anti-Semitic cartoonist Carlos Latuff, and noted critic of the Jews Desmond Tutu, among many others. An Israeli legal group is attempting to counter Gaza's Ark. Shurat HaDin, also known as the Israel Law Center, maintains that the group's efforts constitute "an illegal provocation and an act of criminal violence against the state of Israel and its armed force," according to Nitsana Darshan-Leitner, the center's director. "As the [United Nation's] Palmer Commission has found, Israel's coastal blockade of Gaza is in complete conformity with international law and any individual or group that attempts to run the blockade from any direction is engaged in an illegal provocation and an act of criminal violence against the state of Israel and its armed forces," Darshan-Leitner told the Washington Free Beacon. "It is illegal for U.S. citizens to either raise funds to outfit or participate in a naval expedition against an American ally such as Israel. It is a clear violation of the Neutrality Act and other federal penal laws." Darshan-Leitner said her group intends to pressure United States and European law enforcement agencies "to take preemptive action this time to thwart those outfitting the boat and sending volunteers to participate in this naval expedition in violation of the Neutrality Act and international law." Darshan-Leitner expressed frustration with United States and European leaders for failing to adequately stop illegal actions against Israel. "It is very easy for President Obama and European leaders to plead and pressure Prime Minister Netanyahu to apologize to an extremist regime like Turkey but when it comes to ordering the Justice Department to uphold the law and take preemptive measures to stop this future flotilla, to investigate its U.S. funding and move to prosecute Israeli haters like Noam Chomsky, the U.S. suddenly finds that it has no obligations and negligently refuses to act," she said. Elliott Abrams, a former Bush administration national security adviser, said the activists lack credibility. "This shows how the flotilla movement has declined," Abrams said. "Once a popular cause on the Left and among some influential critics of Israel, it is now becoming the property of nut cases. This means the Israelis have won." Gaza Ark’s U.S. spokeswoman, Pam Bailey, did not respond to a request for comment. This entry was posted in National Security, Politics and tagged Benjamin Netanyahu, Elliott Abrams, Gaza, Israel, Media, Middle East, Obama Administration, Recep Tayyip Erdogan. Bookmark the permalink.